By virtue of the brand's unavailability on the marketplace today, anything one collects from the defunct Martha by Mail catalog service, which Omnimedia shut down in 2004, is rare. Even the catalogs themselves often fetch between $15 and $25 an issue. Of particular interest to many collectors of Catalog For Living merchandise are the cookie cutter sets. Made of copper of a sturdy weight, the cookie cutters were designed in unbelievably unique shapes and sizes. One of the most beautiful examples in my recollection was the large Noah's Ark set, which had giraffe, elephant, monkey and lion shapes (and so many more!) all packaged in a large, boat-shaped cardboard box. Also available were bug and teddy-bear sets, and several 'giant' cookie cutter varieties for the extra-large cookie lover. There were hearts and snowflake sets. There were leaves and acorns. And there were dogs, too! 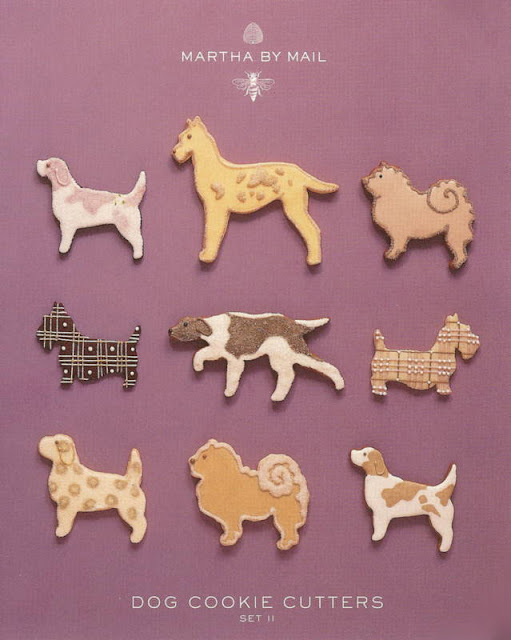 The dog cookie cutters featured the cut-outs of 14 of the most popular breeds, divided into two sets. The original retail price for each set was below $100 but they are selling today on eBay for over $200, because of their rarity and collectibility. Below are examples of the two sets. So much fun and so unique! I'd have a hard time biting into Lassie. These decorated cookies look almost too good to eat! An adorable (and tasty?) 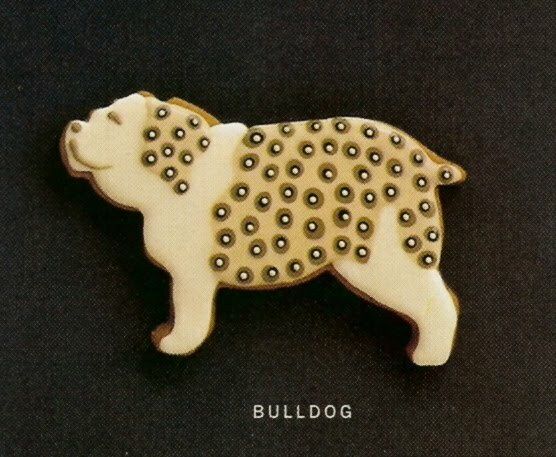 bulldog. Each of the sets came with a special 'magazine' with recipes as well as baking and decorating instructions. 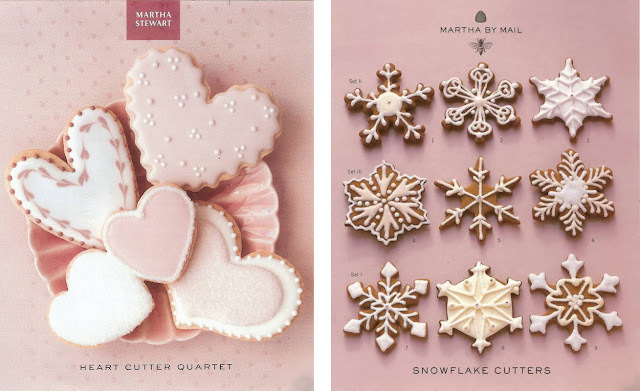 Above are the snowflake and heart-shaped cookie cutter sets from Martha by Mail. Some of the old templates are now available from the Martha Stewart Collection at Macy's, including the snowflake designs. I'm so thankful I have all the cookie cutters from Martha by Mail, even the large oversized ones! They are treasures! Did she ever make a shamrock as part of a set? I have a large, copper one that I picked up at a tag sale. It's about 4" X 5". I've never seen another like it so I thought it might have been part of a holiday collection of some sort. I have the set of hearts and I've kept all of the catalogs--even when housekeeping (i.e., throwing stuff out) I could never part with the catalogs. I always wanted more from the catalogs than I actually ordered - wish I too had all of the cookie cutters - Kenn I'm so envious! I believe she did do a shamrock set, yes. Kenn would be your best source for that info, since he has all of the sets! The catalogs are sheer art, aren't they Vicki? I thought maybe I missed something.. so I double checked and no, there was not a Shamrock cookie cutter, either individual or within a set. It sounds like you have a great cookie cutter though! Vicki, write to either Kenn or myself to receive a copy of the history of the catalog. We'll either send you the data CD (which has images of all the covers) or a printed version. Kenn did a fabulous job on it! I love all my MBM copper cutters and couldn't imagine parting with them. They are used every year for my cookie baking and people always comment on the unique shapes. My cutters are eventually going to be handed down to the next generation of bakers in my family. I too have a lot of the catalogs and from time to time I go through them and reminisce. To think of all the things I didn't buy!! Found your blog after the blog show...I have a been a fan of MS from the beginning, I have all the cookie cutters, catalogs, even the first trail issue, would never part with any of them!I even have a Martha By Mail t-shirt! Great blog! Does anybody know when the item Hearts cookie cutter collection that has 13 hearts came out and was sold? It was item KLC 003 according to the box. Thank you! Hi there. I also have followed Martha since 1982. I have all her books and kept all my magazines, as well as reams of print-outs from the website. At one time, I could have claimed to have all the MBM/Living catalogs, too. But in a momentary fit of "organization," I gently placed them in a garbage bag and (very reluctantly) threw them away. I was trying to appease my husband's derision for clutter. I have never felt more regretful about a tidying-up decision. And then a couple of years later, I saw what I think was the first fairly complete set of Martha catalogs offered for auction on eBay. They sold for $6 and change. I knew for certain then that I had made a terrible mistake. I have slowly collected almost all the sets of cutters (from the catalog and via eBay): large cookies, cookie cutters sets, marshmallow cutters, and even the biscuit and pumpkin cutters. But the most elusive set for me has been the set of Winterbird cutters. Kenn, do you have this set as well? I have the snowflakes, but why doesn't someone re-issue these? Can anyone direct me to a resource with all of the Martha By Mail cookie cutters? I was lucky enough to have bought a few sets at the time and seeing the price they are now going for on eBay makes me wish I had thought to buy more at the time. Thanks so much! I'd love to connect to with other Marth copper cookie cutter collectors. I've created a Facebook Group for this express purpose. If you're interested, please feel free to contact me and I can send you the link to the group page. by any chance does anyone know which company made the cutters for martha by mail? 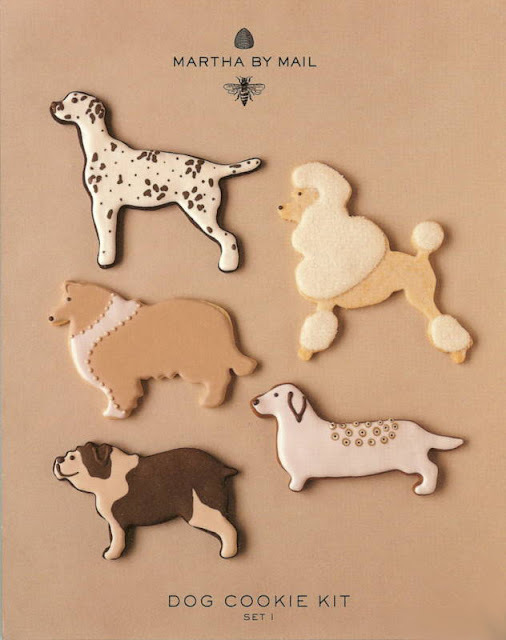 I am selling set 1 of the dog cookie cutters on ebay. 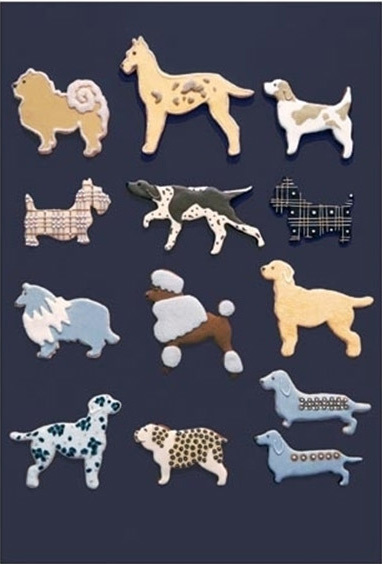 There dog cookie cutters on ebay right now. There is a set 1 and a set 2. I went to Chicago last weekend and hit a few yard sales. At one of the yard sales i saw the adorable dog copper cookie cutters. There was a set and then additional one. I love to make cookies and I love Martha Stewart so I bought them not knowing the history or value of them. I'm so happy I bought them not only for the value but because I love them. I bought them for $5 ea. I can't wait to make cookies. Thank you so much for featuring these cookie cutters and especially for mentioning the original price! I am in the process of collecting them myself and always feel horribly irresponsible for paying as much as I do (via e-Bay/etsy) so to be reminded of the rarity and now to know that they weren't inexpensive to begin with, makes me feel MUCH better about what I consider a splurge! Always my best with thanks for your blog work - I love it! I have the original set of 18 copper cookie cutters of the Noah's Ark Collection, with booklets of recipes by Martha Stewart. Does anyone have any idea of the value of this set? Thanks for any information!